What is AutoCheck Buyback Protection? AutoCheck Buyback Protection is a policy that will compensate you by buying back your vehicle under certain circumstances: if the AutoCheck vehicle history report you purchased or received from a dealer has missed a state title brand, when a title brand was reported by the state and provided to Experian, and prior to the date the vehicle history report was run. The purchase price is up to 110% of the NADAguides.com published retail value PLUS up to $500 in aftermarket accessories. Buyback protection only applies to state reported title brands. It doesn’t apply to accidents or other negative records reported by commercial data sources. How Does AutoCheck Buyback Protection? 1. Purchase an AutoCheck vehicle history report(s) or receive one from your dealer. Check the first page of the vehicle history report for the symbol indicating the vehicle is eligible for Buyback protection. Review the Buyback terms and conditions. Note: The badge qualifies you to register for buyback protection, but only a missed state title brand reported to Experian prior to the date AutoCheck was run will entitle you to a buyback payment. A missed record from a commercial data source will not entitle you to a buyback payment. Not all records are reported to AutoCheck. 3. Purchase a vehicle that shows it’s eligible for Buyback protection on the AutoCheck vehicle history report. Congratulations on your new vehicle! 4. Register your vehicle for Buyback protection within 90 days of the date you purchased your vehicle. 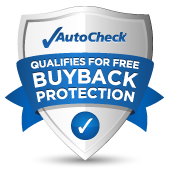 You must be signed in to AutoCheck.com to register for Buyback Protection. If you don’t have an AutoCheck account, you can easily create one. 5. If a title brand was missed and then is discovered on your vehicle within one year of the date on the AutoCheck report, and it was reported to Experian prior to the date on AutoCheck report, submit a Buyback protection claim form and send to Experian. Buyback protection provides a full year of coverage to protect you from state title brands that we may have missed on an AutoCheck vehicle history report. If a title brand from the states’ Department of Motor Vehicles was reported to Experian and is missing from AutoCheck prior to the date you ran the report, we will refund the vehicle purchase price up to 110% of the NADAguides.com published retail value, plus up to $500 in aftermarket accessories. Review Buyback Protection terms and conditions to learn what is covered and how the claim process works. Serious, negative records reported by other commercial data sources, such as accidents, insurance loss or odometer rollback are not covered under Buyback protection. Some of the most common state title brand problems that are covered by Buyback Protection, subject to the AutoCheck Buyback terms and conditions, are listed below. What makes Buyback Protection different? Coverage/Feature: Are aftermarket items covered? Other Guarantee: No. Anything on your car that was not part of the car when it was manufactured will not be covered. AutoCheck Buyback Protection:Yes. Up to $500 of items such as warranties and installed accessories are covered. Coverage/Feature: Is arbitrary cancellation prohibited? Other Guarantee: No. The guarantee can be cancelled at any time at the company’s option. AutoCheck Buyback Protection: Yes. Experian stands behind the AutoCheck Buyback Protection program, and pledges to honor all current and future Buyback Protection claims subject to the terms and conditions. AutoCheck Buyback Protection is available at no extra cost on registered, qualified vehicles if a certain title brand is found after the vehicle is reported to be free of the brand. It’s simple: we miss a state title brand that was reported to Experian prior to when you obtained an AutoCheck report, we buy it back.